Age you started riding First ride at about 9yrs of age on a 50cc mini bike that you started like a lawn mower (rip cord). Then as a teenager got to ride spasmodically on friends bikes without my parents knowing – they would not let me have my own bike, had no idea I was out riding & were dead against them. When I was 18 & brought my first bike home my father would not talk to me for a couple of weeks, and threatened to kick me out of home if I kept the bike. As a normal teenager I just ignored him. 2 bikes later & he gave me $3,000 to go towards my 1st big road bike – A 1984 GSX 750 (see photo). I assume he came to the conclusion I was still alive & was not going to stop riding so he had to come around & accept bikes. Years of Competitive Racing Only competitive racing I have done is with VMXWA – joined 2006, so almost 5 years now. First bike/s you rode 50 cc mini bike (no idea of model age – was a hire bike. You paid $2 to ride around a paddock for 20min – no helmet no safety gear) / DT 100 / / DT 175 / IT 175 – somewhere between 1977 – 1980 – friends bikes. Lived in Kwinana with a lot of bush around. Just pushed them across the road from my friends house into the Bush and was away. Did this until I was 19 when I bought my first road bike. Sold that when I was 22yrs old (1986) , and did not ride a bike again until 1997 – GSX 750 again (1994 model), and have had a road bike since then as well as VMX bikes since 2006. Favourite bike/s you’ve had ZZR 1100 – 1999 model. Your current bike/s Yamaha FJR 1300 – 2005 model, Honda 250 Elsinore CR 74 model, CZ 1969 360 side pipe, XS 650 Johnson – Yamaha side car – approx 1972 / 73 model. Being able to get out in the Bush as a young teenager with my mates. Most memorable (funny or painful) Motocross accident Flipping my side car at Dyback ridge 2009 – quite spectacular for the spectators / painful & costly for me. 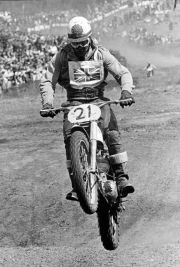 Your Motocross Hero (past or present) None – was more road bike (Doohan / Rainy / Gardener), until joining VMX – Now probably all the guy’s in 55′ & over especially the one’s over 70. Hope i am still capable of riding then. What are your favourite hobbies/interests outside of motocross Other than getting out on the road bike when I can, I do not get much other spare time. Next few weekends after a race meet are taken up getting the bikes ready for the next meet. Why would you want an other hobby when you have VMX? What made you join VMXWA Wanted to get back on a dirt bike, but none of my current friends were interested. I knew someone who rode VMX, so I thought I would come along & give it a try. 5yrs later I am still out there. Having never competed before I have now “got the bug” & enjoy coming to as many race meets as I can.